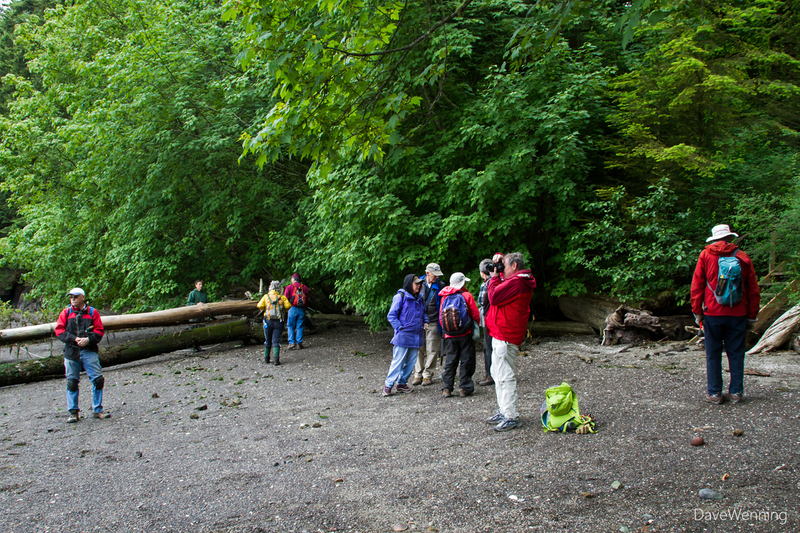 Last Monday, Memorial Day, an all-volunteer force gathered for the Ninth Annual Scotch Broom Pull at Hope Island State Park in Skagit County. 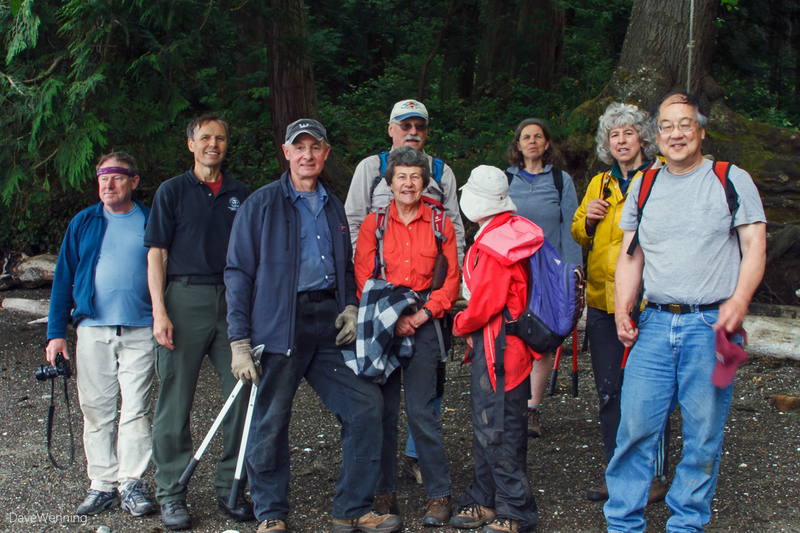 Our Commanding General was Jack Hartt (second from left), Manager of Deception Pass State Park. 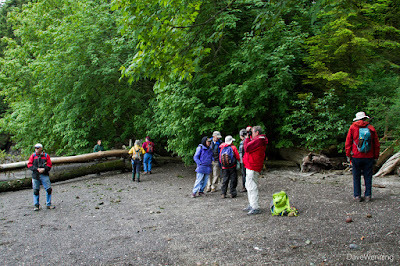 Located in Skagit Bay, Hope Island is an uninhabited marine park and natural area preserve with primitive campsites and anchor buoys for boats. 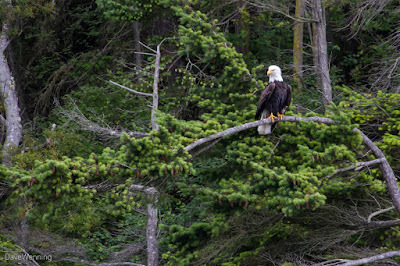 Hope, and nearby Skagit and Kiket Islands, feature some of the last remaining pristine island ecosystems in Puget Sound. This would be my first visit to the island. 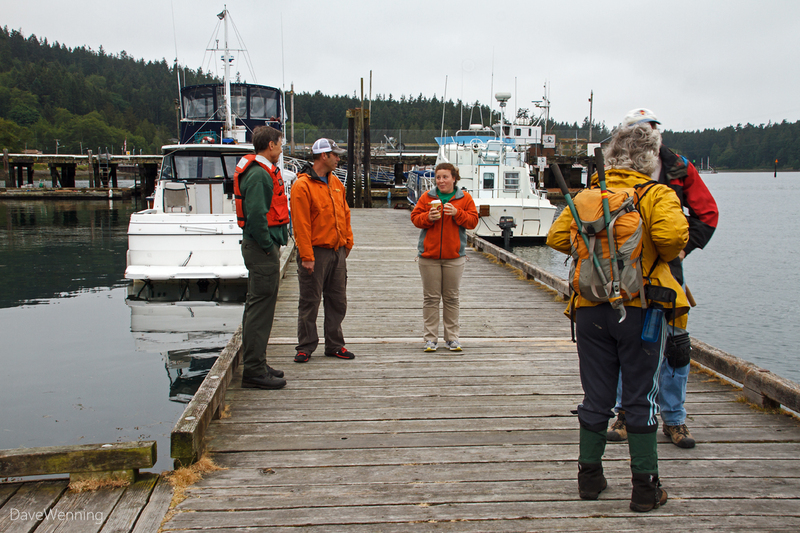 Early Monday morning, we mustered at the Deception Pass State Park dock in Cornet Bay. Our assault would require an amphibious landing on the island. 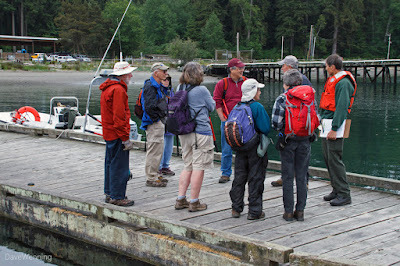 Conferring with Jack Hartt, Captain Brett Ginther and First Officer Alyce Salley from Deception Pass Tours provided transportation. 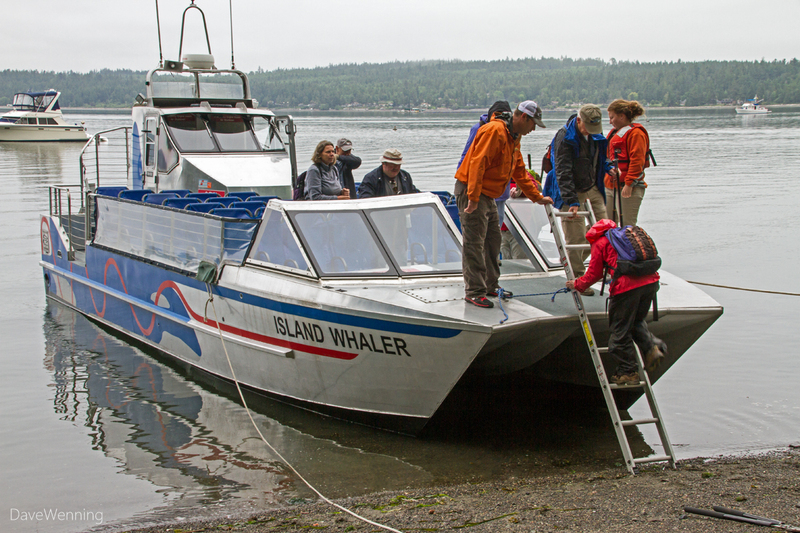 In peacetime, they offer whale watching excursions and boat tours of the Deception Pass area. Memorial Day, however, would be a day for battle with the invasive Scotch Broom. Like a WWII LST on D-Day, the Island Whaler jet boat delivered us to our beachhead on the north shore of Hope Island. On the beach, we prepared for our march across the island to the battlefield on the south shore. When we arrived at the battlefield, our troops dispersed. Engaging this enemy would require close quarter hand-to-hand combat. The weather Monday morning was cool and overcast which were perfect conditions for our engagement. We were catching the plant before it bloomed. When the seed pods ripen, they snap open violently scattering hundreds of seeds far from the parent plant. Our mission was to deprive the plants any opportunity to produce seeds. Scotch Broom (Cytisus scoparius) in the Pea family is an introduced invasive shrub native to Europe. These plants were all fairly small thanks to previous years' efforts to keep it under control. 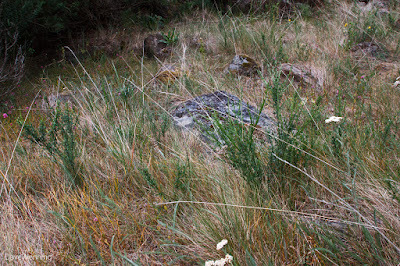 If left to its own devices, it would quickly take over this entire field growing almost 3 meters tall. 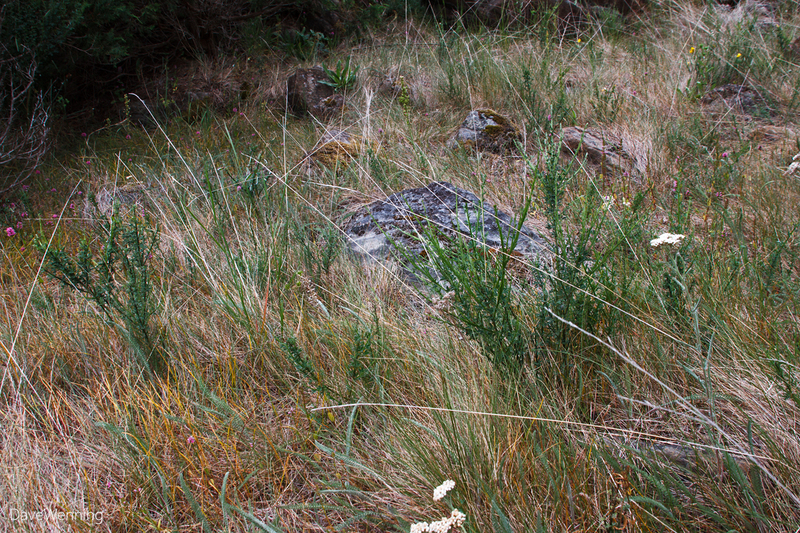 It would replace all of the native mosses, grasses and wildflowers that grow in this meadow. 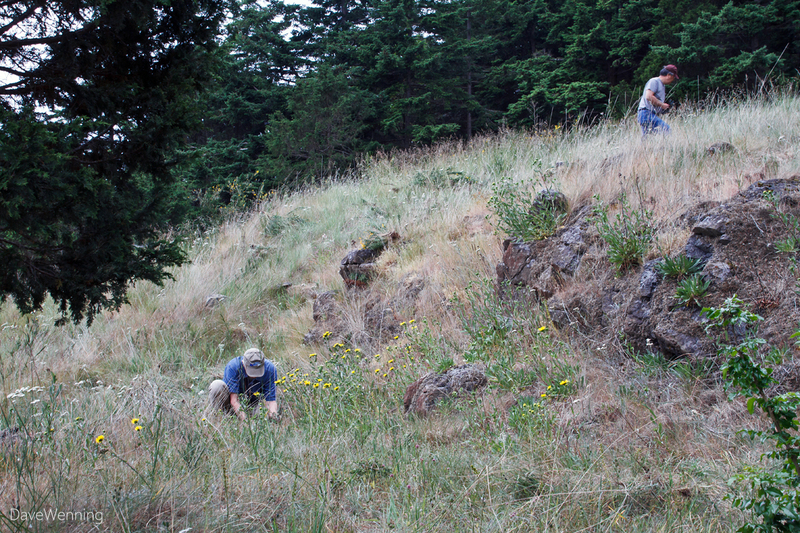 Scotch Broom is included in the State of Washington Quarantine List of Noxious Weeds. Infestation control is required in specific areas of the state. In England, it was known as "planta genista" in the Middle Ages. This shrub became the namesake and royal emblem of the Plantagenet kings. Citizens of Scotland would be quick to point out that "Scotch" is whisky and not a proper adjective. The correct term would be Scots or Scottish Broom and indeed, the Burke Museum Herbarium at the University of Washington also uses "Scot's Broom." Nevertheless, the the term "Scotch Broom" has become part of the English vernacular outside of Scotland. In the end, this battle would become a solitary, quiet and contemplative activity. My weapon of choice was a small garden pick. It was very useful to help pull the plants from the ground or to cut off the stubborn ones below ground level. The yellow flowers now blooming in the field are Puget Sound Gumplant (Grindelia integrifolia). Other wildflowers in bloom were Common Yarrow (Achillea millifolium) and Sea Blush (Plectritus congesta). 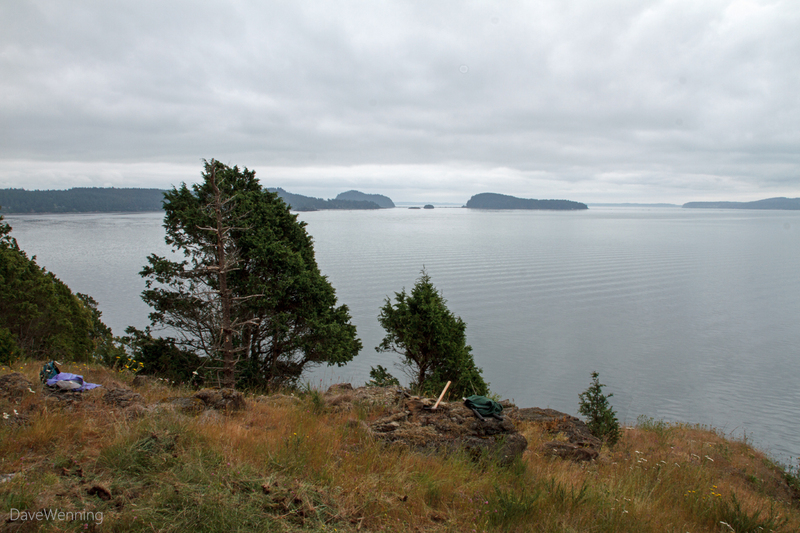 The view southeast across Skagit Bay includes Goat Island on the horizon, Fidalgo Island on the left and Whidbey Island on the right. The tiny specks are Deadman and Little Deadman Islands. The shrubby conifers here are Seaside or Puget Sound Juniper (Juniperus maritima). This is a unique and interesting species recently distinguished from the Rocky Mountain Juniper (Juniperus scopulorum). It seems to prefer island living in Puget Sound and the Strait of Georgia. This is the same plant that grows at Juniper Point in Washington Park in Anacortes. Preserving this habitat for the Seaside Juniper and the other wildflowers here justifies waging war on Scotch Broom. Like Patton at Palermo after our battle, we were given a victory tour of Deception Pass by Deception Pass Tours. This was a real treat for us and much appreciated. 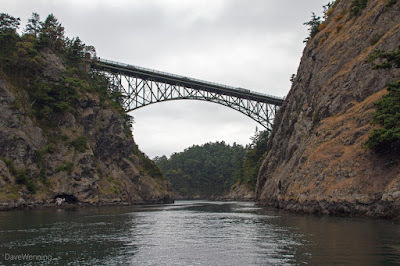 First, we headed west through Canoe Pass, the narrower of the two waterways that separate Fidalgo and Whidbey Islands. That is Fidalgo on the right and Pass Island on the left. 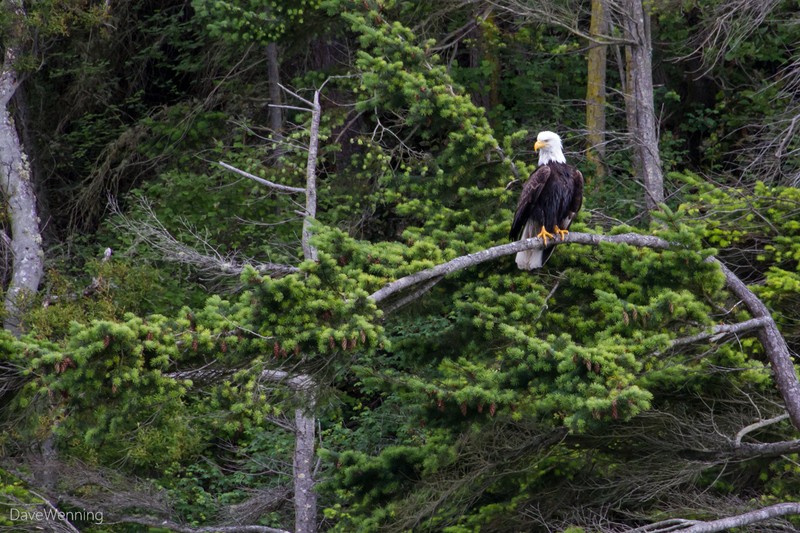 On our right, this Bald Eagle perching on the shoreline seemed to approve of our morning's efforts. Rounding Pass Island we engaged the wider and more turbulent Deception Pass. The pass was named "Deception" by George Vancouver in 1792. Exploring Skagit Bay, Whidbey Island appeared to be a peninsula attached to the mainland. 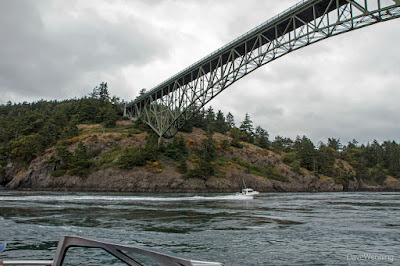 When exploring the west side of Whidbey, what they thought was an inlet turned out to be a narrow passage into Skagit Bay. 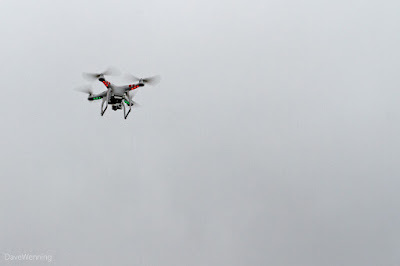 In Deception Pass, this drone flying overhead seemed to be checking us out. 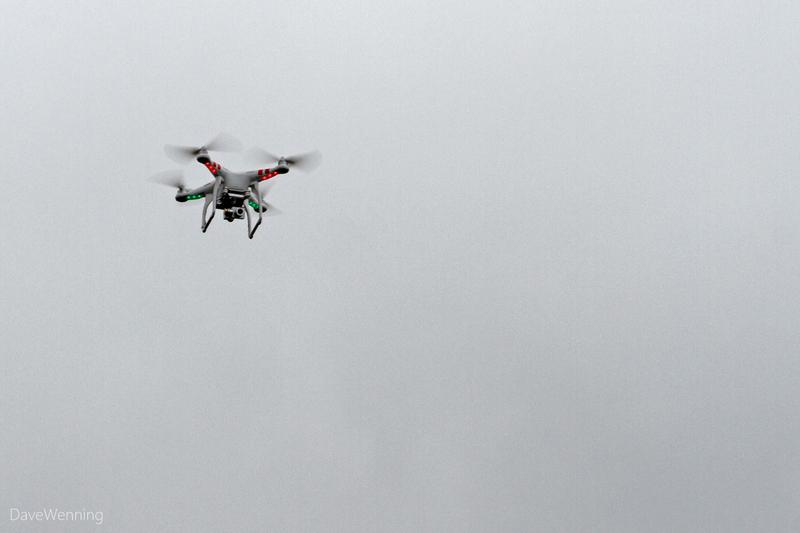 That's a camera mounted between the landing gear. Do you suppose it was controlled by an enemy agent working for Scotch Broom? 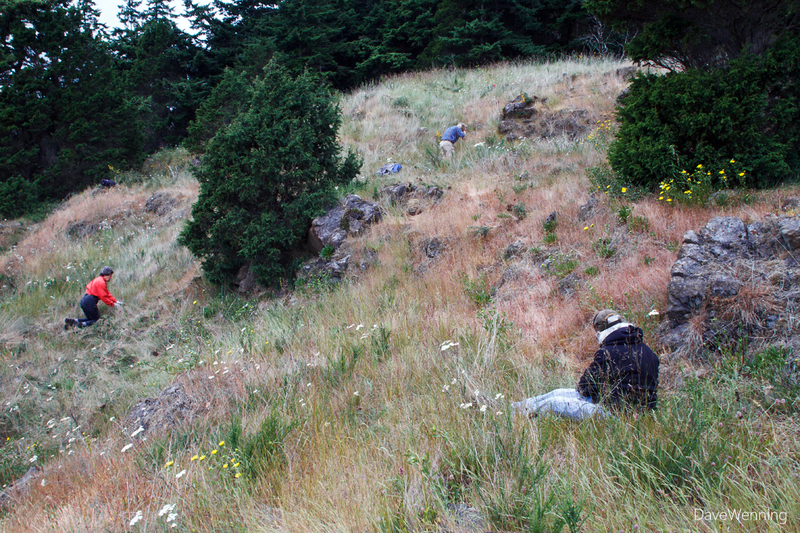 Was it gathering intelligence to prepare for engagement in next year's Scotch Broom assault? Viewed from my house, Hope Island is near the center of the photo just behind Skagit Island. The photo was taken close to sunset. As you can see, the skies had cleared in the afternoon. Helping to keep this island in a natural state was a great way to spend the holiday. I am already looking forward to taking up arms and joining the battle again next year.